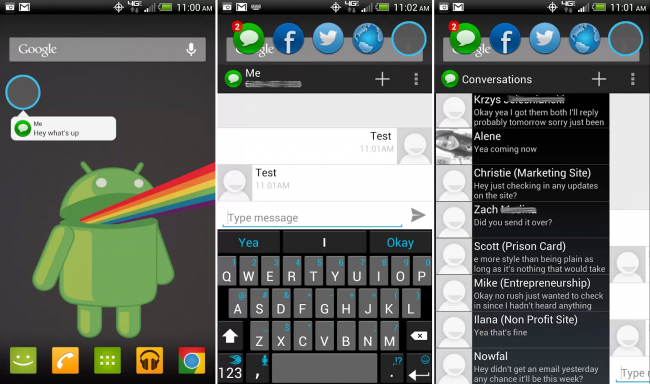 Remember Paranoid Android’s awesome Halo feature that allowed for multitasking apps like Facebook’s Chat Heads? Well, that team’s code went open source, and since then, other developers have been hard at work making it a better and more widely-available solution for multitasking woes. The application is called Portal and can now be found on Google Play – no root required. With Portal, users can access recent notification through a persistent bubble that appears on your homescreen. When the portal is open, you can access your texts, Facebook status updater, Twitter updater and your Internet browser app. It’s a new application and the developers have told us that a lot more work is coming down the pipeline to refine the overall experience. Floating notifications aren’t really my thing yet, but after playing around for a bit, I could see how someone could easily integrate this into their device and benefit from it. Go check it out for free on Google Play, then let us know what you think down below. Feel free to leave feedback in the comments section, as I am sure the developer is genuinely curious.